The Swedish krona is one of our favourite currencies heading into 2019 and we think it will be one of the best performing currencies within the G10 group of most traded currencies. As with its Scandinavian cousin, the NOK, the majority of this strength will likely come from interest rate hikes from its central, the Riksbank. In the past few years, the Riksbank has developed a reputation of sticking to its dovish credentials of extremely low interest rates doggedly, keeping the krona weak. We think that 2019 is the year that this comes to an end as the Riksbank aims to get ahead of the European Central Bank’s own decision to raise interest rates. The driver of why this is set to change will be inflation that we think is likely to run above the Riksbank’s predictions with the softness in core inflation – inflation minus fuel – previously used by the central bank as a reason to keep rates low. Any change in this language will see a quick swing in sentiment in favour of the SEK. On a more prosaic note, the Swedish housing market is showing signs of growing in a more controlled and healthy manner than previously. Past fears that a raising of interest rates would pop a housing bubble have dissipated and wider increases in supply will help keep things more manageable in the longer term. Risks to our forecasts largely focus on trade; Sweden is an extremely trade sensitive country and while we believe a large amount of negativity on global trade is priced into the SEK for now, a larger dislocation in global growth due to a lower appetite for Swedish exports would invalidate our calls for a higher SEK. 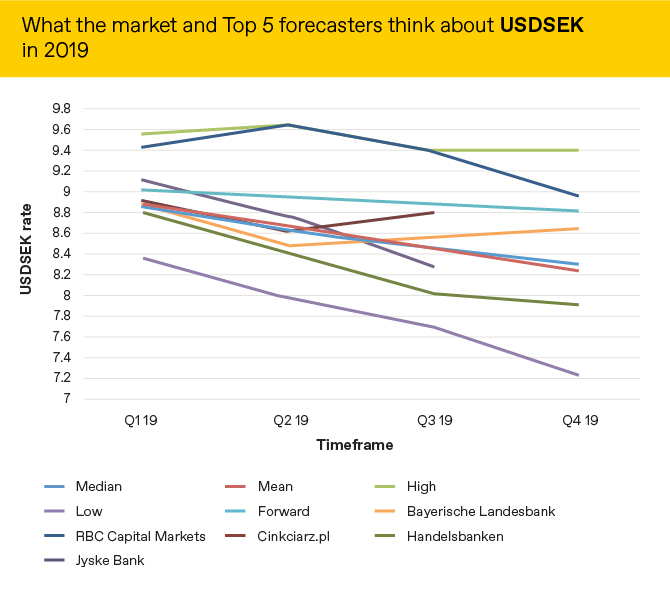 Market expectations of what will happen to the SEK versus the USD are below alongside the predictions of the 5 most accurate forecasters as measured by Bloomberg.